Recently I set out to make Kate’s recipe, only to realize that I was a little short of the cup of banana the recipe calls for. You know how you might have “2 bananas”, but they might be smallish or biggish and not produce the right amount once you mash them? And because I hate touching and smelling (and seeing, and thinking about) soft squishy bananas, I don’t freeze them until I have enough for baking, because opening that ziplock bag to a gust of banana-scented freezer air is the wooorst. Fortunately for me, I can avoid dealing with my banana issues these days. I decided to make up the difference with applesauce. I only had one of those squeezy packs, though, so I squirted it into the measuring cup – and then decided to add extra and use up the whole pack. The bread turned out even better than usual – super moist and light. Without me mentioning the small change I had made, my mom and Jay both noticed the difference! 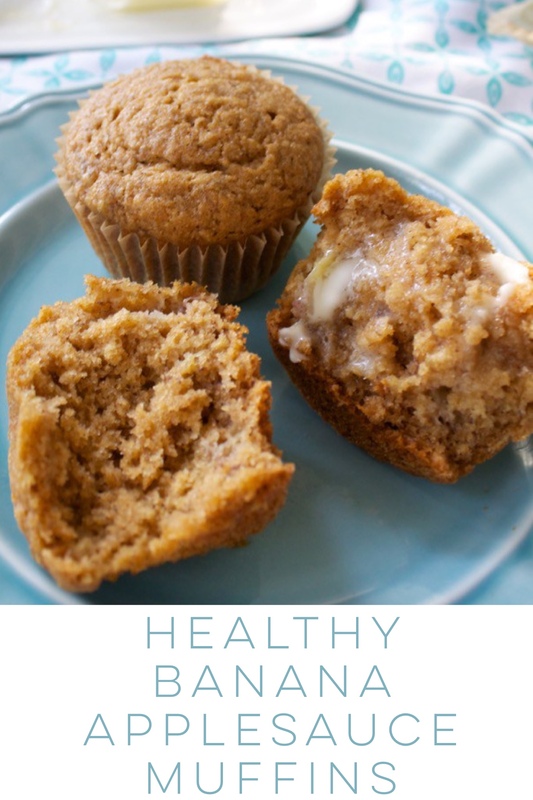 So: you can make healthy banana applesauce muffins no matter how many overripe bananas you have on hand! 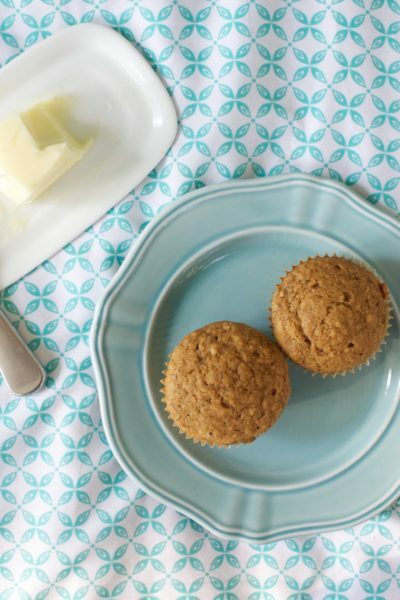 You don’t need an exact ratio of banana:applesauce, as long as the total amount is around 1-1/4 cups for a dozen muffins. All whole wheat flour in these babies. I included the measurements for 12, 18, or 24 muffins (or 2, 3, or 4 brown bananas), because it seems like I’m always struggling through the math to adjust the recipe according to how many bananas I have! The girls and I love having these around for breakfast or snacks, and they’re a great way to stock your freezer. 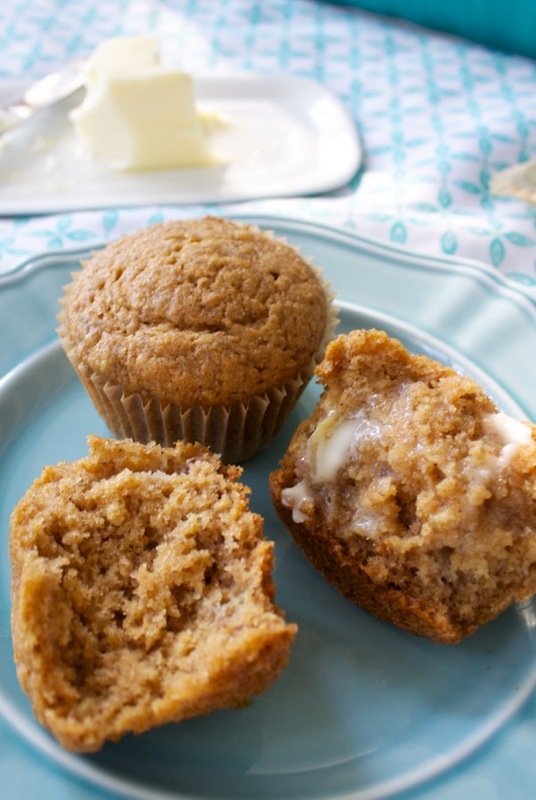 Warm, with a little melty butter – banana applesauce muffins are my love language. Preheat the oven to 325. Whisk oil and honey together in a large bowl. Add eggs and whisk to combine. Add banana/applesauce mixture and mix. Add milk and whisk, then whisk in baking soda, salt, cinnamon, and vanilla. Gently fold in flour with a spatula until combined. Scoop batter into muffin tin (lined with paper muffin liners, or greased), filling cups about 2/3 full. Bake for 20-23 minutes, until a toothpick comes out clean. Let the muffins cool in the tin for a few minutes, then transfer them to a wire rack to cool completely. The muffins will keep at room temperature in a sealed plastic bag for several days, or you can freeze them indefinitely to thaw as needed! This recipe is slightly adapted from Cookie & Kate’s Healthy Banana Bread recipe. 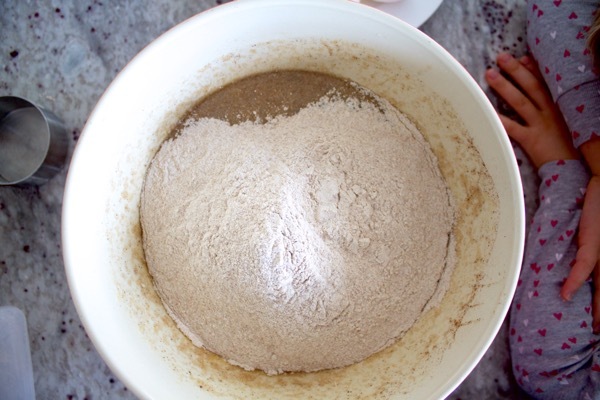 See her recipe for notes on substitutions, making it vegan, and adding mix-ins! Since bananas vary in size, add as much applesauce as needed to get the total amount of banana/applesauce mixture called for in the recipe. 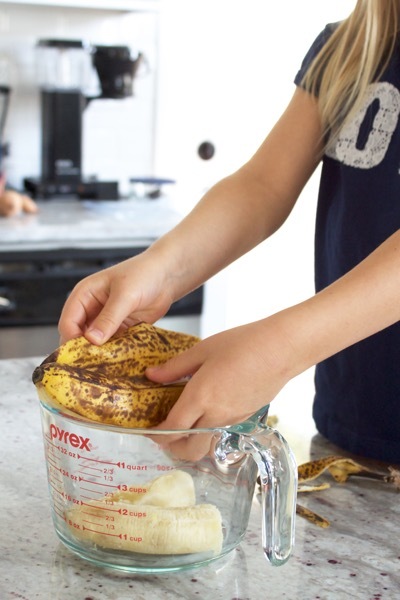 I like this method since I can deal in “number of bananas” vs. “cups of mashed bananas” and tell at a glance if I can make this recipe and how many muffins I’ll end up with. Adding a little extra moisture with applesauce make them extra soft and fluffy! To make bread, make the 12 muffin quantity (= 1 loaf) or 24 muffins (= 2 loaves) and bake for 55 minutes-1 hour. This is seriously sad. Soon and very soon!! I made this for my 11 month old baby and he loved it. The muffins turned out to be super fluffy. All the adults and babies that had it loved it. I’m planning on using this recipe to make a cake instead of muffins for my baby’s first birthday. Any tips when converting this from 12 muffins to a 9 inch cake ? Thank you for giving three recipe ratios (per muffins desired). I love the texture! The only thing I would change is the amount of honey/ maple syrup. I used 2/4 honey, 1/4 our maple syrup and they were too sweet for my taste ( and I have a sweet tooth)… maybe it’s because I used pure maple? Hi Trudy! I think if you want to reduce the sweetness next time you could probably safely cut it 25%-ish and not change the texture drastically! Let me know if you try it and it works out!! And you’re welcome re. the muffin-quantity options – I found myself doing the math way too often and wanted to make it easier on myself. I’m so glad it was helpful to you too! !